Victims of child abuse at Catholic institutions in the Irish Republic have expressed anger that a damning report will not bring about prosecutions. The report, nine years in the making and covering a period of six decades, found thousands of boys and girls were terrorised by priests and nuns. Government inspectors failed to stop beatings, rapes and humiliation. 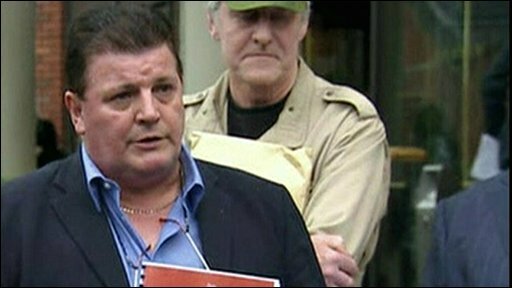 John Walsh, of Irish Survivors of Child Abuse, said he felt "cheated and deceived" by the lack of prosecutions. The findings will not be used for criminal prosecutions - in part because the Christian Brothers successfully sued the commission in 2004 to keep the identities of all of its members, dead or alive, unnamed in the report. Mr Walsh said: "I would have never opened my wounds if I'd known this was going to be the end result. "It has devastated me and will devastate most victims because there are no criminal proceedings and no accountability whatsoever." 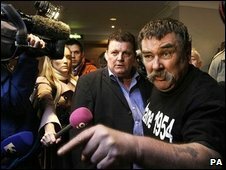 Police were called to the Commission to Inquire Into Child Abuse's news conference in Dublin amid angry scenes as victims were prevented from attending. The victims were among 35,000 children who were placed in a network of reformatories, industrial schools and workhouses until the early 1990s. 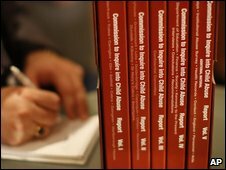 More than 1,000 people had told the commission they suffered physical and sexual abuse. The five-volume study concluded that church officials encouraged ritual beatings and consistently shielded their orders' paedophiles from arrest amid a "culture of self-serving secrecy". The commission found that sexual abuse was "endemic" in boys' institutions, and church leaders knew what was going on. Most computers will open PDF documents automatically, but you might need to download Adobe Reader. It also found physical and emotional abuse and neglect were rife in some institutions. Schools were run "in a severe, regimented manner that imposed unreasonable and oppressive discipline on children and even on staff". It found the Department of Education had generally dismissed or ignored complaints of child sexual abuse and dealt inadequately with them. As far back as the 1940s, school inspectors reported broken bones and malnourished children but no action was taken. The report proposed 21 ways the Irish government could recognise past wrongs, including building a permanent memorial, providing counselling and education to victims, and improving current child protection services. "This report makes it clear that great wrong and hurt were caused to some of the most vulnerable children in our society," he said. "It documents a shameful catalogue of cruelty: neglect, physical, sexual and emotional abuse, perpetrated against children." The leader of the Roman Catholic Church in England and Wales, the Most Reverend Vincent Nichols, said those who perpetrated violence and abuse should be held to account, "no matter how long ago it happened". "Every time there is a single incident of abuse in the Catholic Church, it is a scandal. I would be very worried if it wasn't a scandal... I hope these things don't happen again, but I hope they're never a matter of indifference," he said.